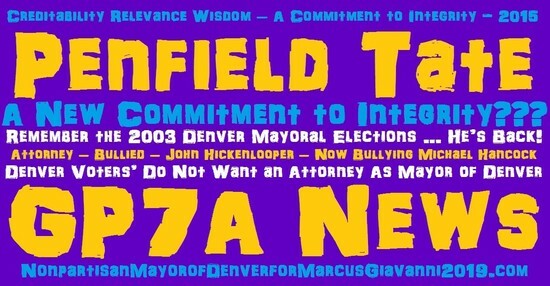 Mayor of Denver 2019 - "Penfield Tate Mayor of Denver 2019" - -#tatefordenver, Penfield Tate A New Commitment to Integrity or the Same Old Song and Dance? 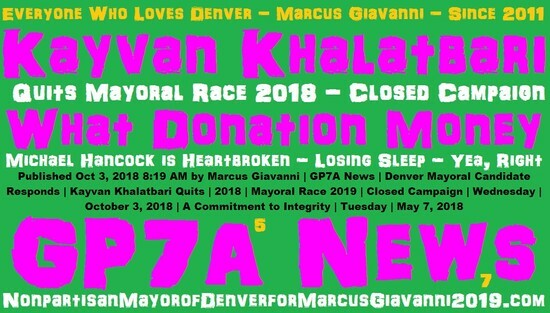 Mayor Denver 2019 Kayvan Khalatbari Quits and Outdated Tate the verified Outdated Former State Senator. When you All understand the Social Credit system, who most local and national media authorities. Have no clues about the future of WWW in 2020. Will be an entirely new category and subject matter Algorithms in all Browser Searches. Penfield Tate Denver Mayor 2003. And now in 2018, Penfield Tate Mayor 2019. Is not what Voters' want as their mayor. This happened in 2003 Denver Mayoral elections. And you won't hear or see the media talk to these voters. Thanks #tatefordenver. Here is an Algorithm Internet is a Tyrannical Beast That Feeds on the Emotions and Habits of Humans. Top AI Algorithms = Credibility Relevance Wisdom the older a person is, and the more compliments and failures; a completed bucket list of sorts. In the future of the www commitment of keeping it real, and always Do the Right Thing. Don’t Be Evil was to Whimsical, Honest, and should be saved for Halloween 2018. Some students, who are super competent citizens, stay on track, and become responsible United States Citizen. And there are thousands of Students who are lost, and off tract. And need a little nudge to be put back on the right track. So they don't become homeless, or need low cost housing. 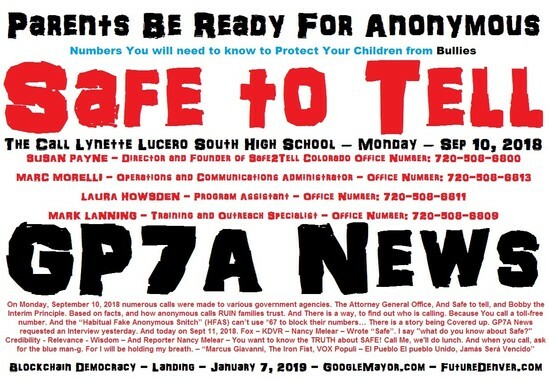 Something Outdated Penfield Tate III uses to scare voters. Thinking "Penfield Tate" going to fix things. Penfield Tate III can only steal other candidates content. Thinking nobody will notice. And other identifiers, to the claims, Penfield Tate III is Outdated politician, trying to make a comeback. With other candidates content, and platform located on the Internet, and emails. to become Penfield Tate Mayor of Denver. 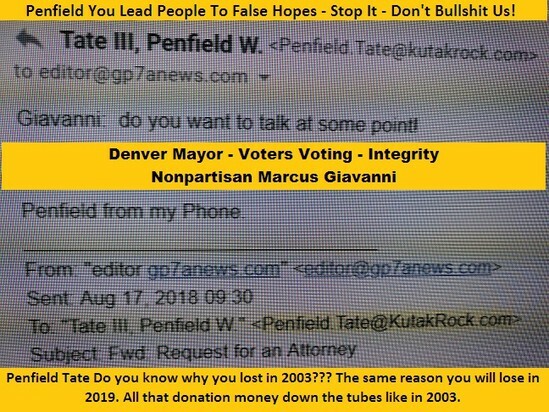 In 2003, Voters said no to Tate Denver Mayor 2019. The common core is a bad educational Ideology. Parents want to choose their children’s schools. And those who can’t afford to go to the school they want. Will also have the same opportunities as the schools they want to go to. But they know in the real world. They can’t afford to go to the school they want. They always have a plan B. Plan B’s are in short supplies, because the current Mayor Michael Hancock has a monopoly control on the city and county of Denver Government Takeover. And it’s 2/3 of the citizens of Denver. Who are now sick and tired, of being sick and tired. 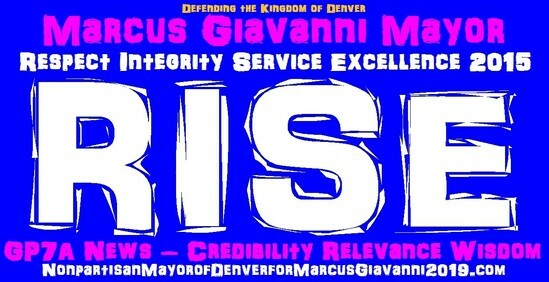 The silent Majority Denver Voters’ are talking, and they are not following, liking, commenting. They are keeping their Vote, and concerns to their Inner circles. They don’t participate in the negative, mudsling, fake, and bias Bullshi. Denver Voters saw all the wasted money, time, and false hopes from candidate. What “Kayvan Khalatbari quits”. And Tate the outdated former State Senator. Who thinks he is going to establish the Penfield Tate New Commitment to Integrity. Since the media allows certain candidates a right to speak. As they have for the last 54 years. And it appears they are up to the same old school journalism, that has allowed Denver to be monopolized for 54 years. We had to create Our own way to communicate, with the Denver Silent Majority Voters, Democrat Voters, Republican Voters, Libertarian Voters, Green Party Voters. And Yes, the Independent Voters. These voters are sick and tired, of being sick and tired. These voters have learned that Denver is a nonpartisan Government. that has been taken over by the Democrat Party. And they have become so emboldened, and now have created a monopoly Government. 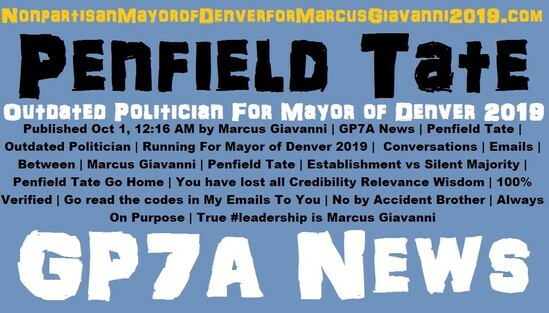 Penfield Tate is an Outdated Politician For Mayor of Denver 2019. A crowded field of Mayoral Candidates. Published Oct 12, 2018 5:29 AM by Marcus Giavanni | GP7A News. 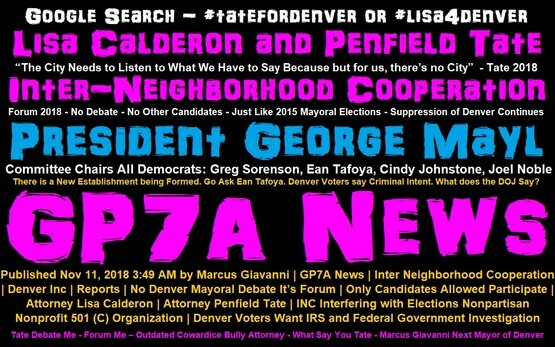 http://www.gp7a.com/penfieldtate.html #denver7, #denver, #leadership, Penfield Tate Outdated Politician For Mayor of Denver 2019. #mayor2019. @denverteachers, @cityofdenver. Penfield Tate Mayor of Denver 2019. Longtime Mayor Michael Hancock laughed at Penfield Tate Denver Broncos TV commercial during the game. 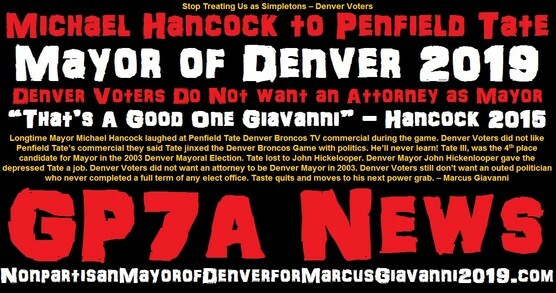 Denver Voters did not like Penfield Tate’s commercial they said Tate jinxed the Denver Broncos Game with politics. He’ll never learn! Denver legally nonpartisan government, not just election system. And it has been altered, some authorities have been notified by citizens of Denver. 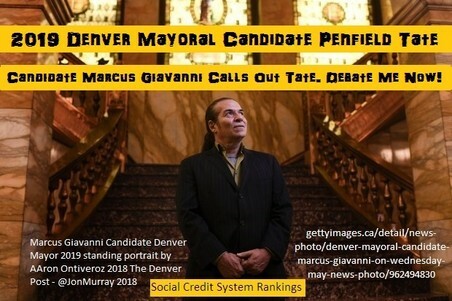 "Mayor Tate: Mayor of Denver 2019 will not be Mayor Michael Hancock. Or Penfield Tate. 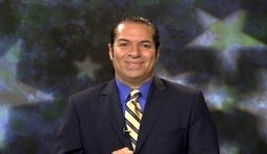 Did You Know Kayvan Khalatbari quits". "@tatefordenver, #timesuphancock.